All you need for group and individual sensory play, this huge UV reactive sensory kit contains a wide and varied range of engaging toys that glow in the dark and fluoresce under UV blacklight for visual stimulation and an improved understanding of colour and light. 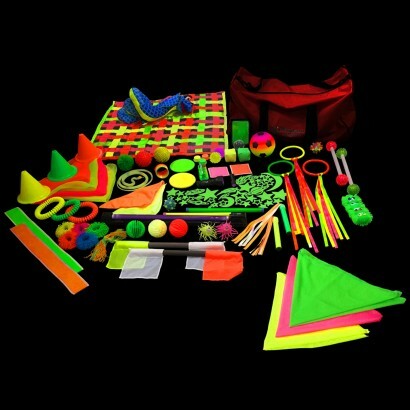 A large and extensive kit that comes complete with a large UV blacklight, a large UV torch and a small UV torch that allow the toys to fluoresce brightly, this kit has all of your sensory requirements covered from soft and tactile to vibration, groan sticks and even squidgy putty, this impressive kit will captivate and engage sensory groups. All of the toys and lights fit together and sit inside a handy extra large bag on wheels for easy transportation and storage.